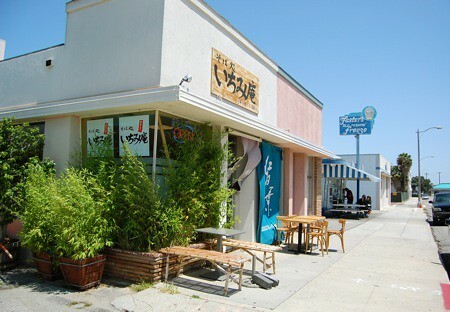 Ramen California in Torrance definitely has something different going on. The lunch menu is small and I was sorry to see some of the appetizers I wanted to order weren’t available until dinner time. The main attraction here is the ramen and this being my first time, I just ordered a medium bowl of the Californian Ramen which boasts of having lots of vegetables. The catch at Ramen California is that instead of the milky, pork-flavored broth most ramen places have, theirs is made out of chicken. The bowl of ramen arrived in all its colorful glory. Red beets, purple and yellow cauliflower, and green broccoli all sat happily in a clear chicken broth. First the good news. 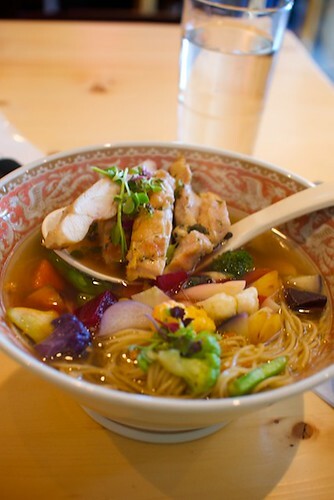 The broth is so fantastic, it’s worth making the trip down to Torrance. It tasted like pure chicken and had a thick, satisfying mouthfeel for such a clear broth. It was lip-smackingly good. The noodles were also extraordinary. Their texture was smooth and different than the usual crinkle texture that ramenyas like Santouka serves. They weren’t overcooked at all, had the perfect amount of bite, and did a great job of delivering the right amount of soup to my waiting mouth. The pieces of chicken (for a $1.50 extra) were tender and juicy for being white meat. They don’t skimp on the quality of the meat here. Now the bad news: the vegetables. I was excited to eat the boasted 20-something different types of vegetables. I didn’t really keep count, but there were a few different types of vegetables. They tasted fresh and I could tell that they hadn’t been sitting around in the fridge for a week. The unfortunate thing is that they were all undercooked. I’m personally not a fan of the trend of cooking vegetables al dente, especially cauliflower and broccoli. If I wanted crunchy vegetables, I’d eat them raw. 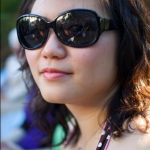 The next time I return to Ramen California (and I do hope there will be a next time), I already know what I’m going to order. The pure soup that has just the soup and noodles — the two best things from the restaurant. Sitting in part of an unassuming building next to a Foster’s Freeze was the most delicious bowl of soba I have ever had in my life. It may be a hyperbole, but the soba I had at Ichimiann Bamboo garden was life changing soba; I will never look at these buckwheat noodles the same ever again. The restaurant is very small with only a handful of 4-seat tables inside and two tables outside. There’s also a counter that faces the wall which was where I chose to sit. Upon entering, I was greeted by a friendly Japanese man. His English was as good as my Japanese, so we had a bit of trouble communicating. 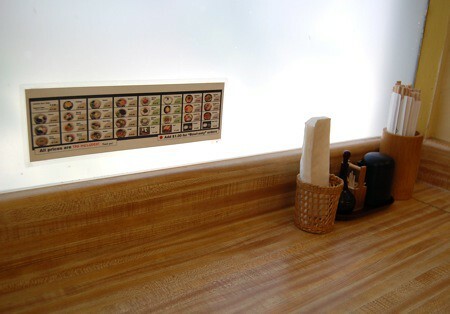 Luckily, there’s a menu with pictures on the back wall as well as a place-mat type menu in English by the cashier machine. 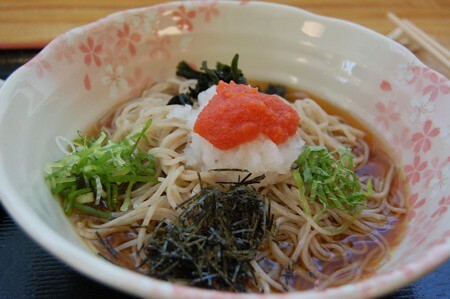 I ordered the mentaiko orochi with cold thin soba noodles. It came with grated radish, mentaiko (spicy fish roe), seaweed, green onions, and the cold dipping broth already mixed in with the noodles. I mixed all the toppings together with the noodle, took a bite and it was like Orff’s O Fortuna exploded in my mouth. 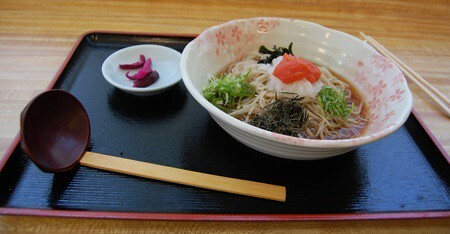 I’ve always been a fan of soba, but this was unlike any soba I’ve had before. The noodles were crisp and chewy without feeling underdone. I thought the broth was too salty at first, but as I ate more of the noodles, I appreciated the taste more. The radish and green onions brought a fresh, spicy bite to the broth while the mentaiko gave it a subtle umami taste. The small dish of pickles on the side was overkill, but I couldn’t stop eating them. I couldn’t stop thinking about the noodles after lunch. Ichimiann also offers thick soba, udon, and different types of rice bowls, but I will definitely be back for more soba noodles. If you really want to appreciate the chewiness of the fresh noodles, I would suggest ordering the cold broth instead of the hot, since hot broth might negate the perfect done-ness of the noodles. 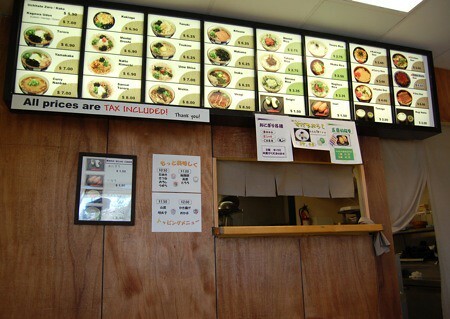 The bowl of noodles is definitely worth battling the 405 around LAX during lunch time and the price is just right too. The mentaiko orochi only cost me $6.50 (including tax, sans tip). The only inconvenience is that they’re cash only, but there’s a Well’s Fargo on the other side of the block.